Ticks and fleas are two common parasitic insects that bite and feed on humans. It is largely due to human exposure to animals, be it pets in the home or livestock on a farm. Wild animals in urban areas, like birds, may also bring these insects in close contact with humans. People who camp, hike and hunt frequently may also be affected by ticks and fleas that live on wild animals. It is not possible to avoid a tick or flea bite throughout life and in most cases it is harmless. But sometimes these ticks and fleas can cause serious diseases which may be life-threatening. Both ticks and fleas are classified as arthropods. This means that they have a hard outer skeleton (exoskeleton), segmented bodies and many pairs of jointed limbs. Most of us simply refer to these types of arthropods as insects. Both ticks and fleas are considered to be parasitic arthropods. It feeds off warm-blooded animals and often causes injury to the host at the site of the bite. Sometimes it causes diseases as well. There are different species of ticks and bites. Each species has a predilection for certain animals but may still feed off other mammals that it comes across opportunistically. Most of the time ticks and fleas pass from the animal host to humans. However, it may attach on grass and other vegetation or even clothing before it passes to humans. The saliva of these insects may irritate human skin and cause reactions. Some people may be allergic to it and have a more severe reaction than others. Although these insects can transmit bacteria into the bite wound, often the localized skin infection that follows may be from bacteria naturally on the skin or on the fingers. Scratching the site of the bite increases the chance of a skin infection. Ticks and fleas live on a number of different animals and survive by feeding on the blood of mammals. Different species of ticks and fleas tend to infest different species of mammals. However, these ticks and fleas may still feed off other mammals if the opportunity arises. The human flea for example rarely lives on humans but will quickly feed on humans and pigs when and where possible. These insects can go for periods of time without feeding – even for months. 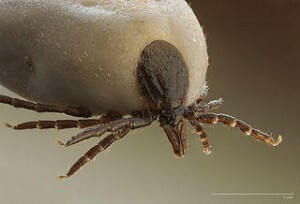 Unlike with animals, ticks and fleas do not usually live on humans. It may stay on the body for several hours to a few days at most. In cases where there are repeated bites over long periods of time, it is not the same tick and flea that is responsible for feeding on a person. The insects feed on humans, drop off and then feed on other people in the area or other animals. The cycle goes for long periods unless it is interrupted. However, eradication can be difficult. Infestation with ticks and fleas is not an issue with hygiene. Bathing animals frequently with tick and flea insecticides can prevent an infestation and therefore reduce the likelihood of humans being bitten. Similarly, frequent bathing for humans can also discourage these parasites. The living area of both animals and humans may be infested with the insect and its eggs which can make it difficult to eradicate. Humans are more likely to sustain bites if they have close contact with animals and if animals reside within the human living area. The penetration of the feeding appendage of the insect into human skin does not usually cause significant damage. It is small and its entry is often painless. However, the saliva of these insects may be the problem. The body identifies the saliva as being foreign and reacts to its presence. The saliva may also have mild anesthetic and anti-clotting properties to allow the insect to feed for long periods without alertying the host. The most common symptoms of tick and flea bites are mild and short-lived. Raised bump (papule) at site of the bite. Bleeding from the site (uncommon). Here are some of the possible complications and diseases from tick and flea bites. These skin and underlying tissue infections can occur with any wound. It arises when the skin is broken and bacteria enters the body. Impetigo is a more superficial infection than cellulitis. The bacteria responsible for the infection is often the same bacteria that lives on the skin. The bacteria may spread throughout the body and can quickly turn deadly. Babesiosis is not a well known infection but is quite prevalent in certain areas of the United States. It is caused by a parasite (protozoan) that is transmitted by ticks. Babesiosis is similar to malaria in that the parasite infects and destroys red blood cells. The elderly an people with weakened immune systems are prone to more severe infections that can be deadly in some cases. Lyme disease is among the more widely known tick-borne disease in the United States. It is caused by the Borrelia burgdorferi bacteria that is spread to humans through the bites of Ixodes ticks. The disease can go through different stages with potentially severe consequences like seizures, hearing loss and partial paralysis. Rocky Mountain Spotted Fever (RMSF) is caused by the bacteria Rickettsiae ricketsii which is spread by tick bites. This bacteria can cause widespread cell damage within the body and also disturb the immune system to further exacerbate the problem. It can progress to life-threatening complications although the disease can be readily treated. The few diseases discussed above are transmitted by tick bites. It is relatively common when compared to other tickborne diseases or diseases transmitted by fleas. Marine typhus and bubonic plague are two examples of fleaborne diseases. 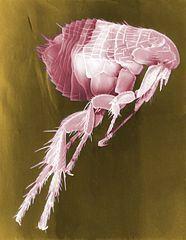 Modern measures to control flea infestations have limited these diseases. For more diseases and dangers, refer to insects that feed on humans.